As is said, history repeats. Similarly, the more things change, the more they stay the same. Indeed, there is no better illustration of the aforementioned than what is taking place at this critical juncture in time. A nation on the brink. That being established, before a particular historical comparative analysis can be fully appreciated and understood, it is imperative to note the timing of the uptick (emphasis placed) in wild and “in-your-face” incitement to domestic terrorism; that which was stoked to the nth degree under the two-term reign of HUSSEIN Obama, an avowed Marxist and Islamist. By the way, said ideologies are not mutually exclusive, rather, they converge in their hatred of freedom-based ethos, as well as in their totalitarian methodologies. In fact, as a precursor to the charges within, the following (which was written in April 2013, out of a long compendium of analytical proofs) is a jaw-dropper, thus, to be utilized as a stepping-stone from yesteryear to the here and now. Back in March 2013, I received a shout-out (one out of a very long list) from the publishing team of “Bringing Down America: An FBI Informant with the Weathermen (by Larry Grathwohl and Frank Reagan) to write its maiden review. Now, never having been in contact with this outfit beforehand, apparently, my “reputation” precedes me – or, so I am told. In any case, its essence couldn’t be more timely; a barometer and harbinger of things to come. 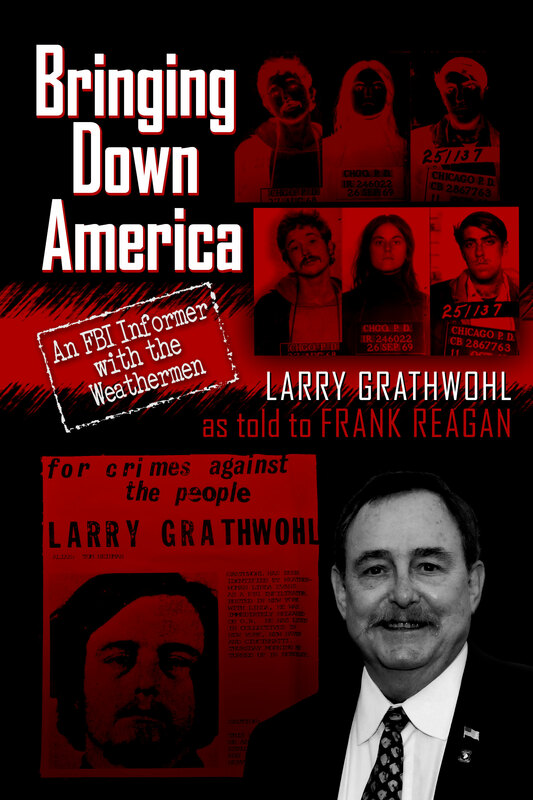 BRINGING DOWN AMERICA: An FBI Informant with the Weathermen, by Larry Grathwohl and Frank Reagan, originally published in 1976, is being reintroduced in 2013. Its introduction is written by Dr. Tina Trent. The implication was very clear. The FBI understood that the Weathermen were deepening their foreign ties. It was inevitable that Arab terror contacts would be made. Thus, Ali Baba, an Arab informant, was sending a warning to Larry: having him as a “go-between” would mitigate any hesitation to cooperate with the Weathermen, in effect, keeping the FBI one step ahead. The list of “respectable” cover, of other “notables” in the Weathermen, is equally impressive. Through a stringently planned operational “stealth jihad”, yesteryear’s Weathermen have returned, fully primed to carry out their original goal — the “transformation” of Amerika. Most significantly, they subvert the national interest from a distinctly dangerous vantage point. They are currently ensconced in some of the most powerful positions in academia and political life. The only difference is, this time they are dressed in “capitalist” garb, not only in their clothing choices, but in the wealth they have accumulated, paradoxically, through joining the “establishment”. Who said one can’t enrich oneself, but at the same time deny the masses/proletariat said wealth potential? Highly dangerous in their bomb-making days, their capacity to cripple America, sans firing actual weaponry is that much greater at this critical juncture in time. Deeply involved in the “transformation” process, as promised by President Obama, many of them working inside the executive branch, while others operate through progressive think tanks, they want nothing more than to distance themselves from their bloody past. Therefore, an omerta has descended from the denizens of the leftist media and their powerful organs. So the timing of this book release couldn’t be more prescient. Although the mainstream media will surely attempt to shield the aforementioned from the facts borne out by the record, they are nothing more than “koshered” domestic terrorists. Many westerners believe that history is behind them and therefore has no relevance to their lives. Nothing could be further removed from reality, or more deadly. In this regard, stepping back in time to the late 1960s and into the 1970s couldn’t be more imperative or instructive. In reality, to those who see America’s foundational roots as a beacon for liberty (despite a plethora of dismal leadership…nary a statesman in the crap-laden bunch), HUSSEIN’s domestic incitement was never in question. However, it wasn’t until six months into his second term that Obama Inc.’s laid groundwork (again, during his first term) came to fruition. As is known, Rome wasn’t built in a day. Resultant, it was during the very same six months that a “gift” came his way, thus, HUSSEIN latched onto what should have been a policing and investigatory matter, the death of Trayvon Martin, to set the national stage for racial unrest – the likes of which had not been seen since the 1960’s/70’s. Not only that, he used his bully pulpit to stoke the embers for an actual “war on cops“- with the intent to ignite facts on the ground toward total anarchy. Moreover, as expected, Tray’s death was followed up by a full-throated call for gun control. Imagine that. Incontestably, time and again, the (former) Radical-in-Chief incited (and continues to) to domestic terror! All of which has now come full circle; a tipping point within America. A time that future generations may very well cite as the nation’s second civil war. Mind you, if additional heft is needed to document their present-day deadly intent, look no further than to the actions taken by James Hodgkinson, a 66-year-old volunteer in Bernie Sanders’ campaign, when he opened fire on GOP lawmakers practicing for their annual baseball game with the Democrats! For heaven’s sake, is nothing off base…. In this regard, recall when House Majority Whip Steve Scalise was wounded (June 14, 2017), almost mortally, at the GOP outing. If not for the quick response of Scalise’s security detail – having prevented Hodgkinson from carrying out a mass atrocity – the result would have been far worse. Never mind the attacks on others, including, Senator Paul Ryan while mowing his lawn! Yes, his attacker, a neighbor, according to The New York Daily News reported that a Facebook page for Boucher contained numerous postings critical of US Republican President Donald Trump. Sounds familiar? Still, if more proof of the same is required, that’s okay. Ipso facto, ALL Trump voters/supporters are “fair (target) game”, as are his associates on Capitol Hill – in whatever capacity they may be. To wit, as my April 2, 2013 book review “Bringing Down America” more than proved, just as in the 1960’s/70’s (the Weathermen were led by Bill Ayers –HUSSEIN’s buddy from the Chicago ‘hood) when countless campuses and beyond across America were on fire, so too the nation is now ablaze. Mirror images. Know that the exact same blueprint is their bible; yes, Alinsky’s 13 “Rules For Radicals” is the founding document which outlines the steps they are taking to (purposefully) precipitate an upcoming civil war. Ignite. Demonstrably, how else can one explain the usage of “Rule Number 13” (1- 12 as springboards) in today’s fiery arena, as targets are picked, frozen, personalized, and polarized. Think: the incitement of “Mad Maxine Waters” (and many others), and the immediate knock-on effects to Kirstjen Nielsen, Sarah Sanders and others associated with “Trumpian” views of America! RULE 13. Pick the target, freeze it, personalize it, and polarize it. Don’t try to attack abstract corporations or bureaucracies. Identify a responsible individual. Ignore attempts to shift or spread the blame. The real action is in the enemy’s reaction. The enemy properly goaded and guided in his reaction will be your major strength. Coincidence? In a pig’s eye. More specifically, anyone in their right mind – no pun intended – who believes that the likes of Hamilton Nolan, a senior writer at Splinter News (which is under the direct ownership of Fusion Media Group – a division of Univision, a leftist biased conglomerate – having tasked Splinter to “amplify underrepresented voices, shine a light on systemic inequality, and skewer politicians when necessary as well as contextualize current events, challenge archaic establishments, and champion the historically oppressed”) is not in a position to “read the radical tea leaves” is, simply, delusional. “Do you think that being asked to leave a restaurant, or having your meal interrupted, or being called by the public is bad? My fascism-enabling friends, this is only the beginning,” writes Splinter senior writer Hamilton Nolan. “This is what happens when citizens decide en masse that their political system is corrupt, racist, and unresponsive,” says Nolan. History repeats. The more things change, the more they stay the same. Then, as in now…. This entry was posted in Uncategorized and tagged "Demsters/Leftists/Islamists - Via Fakestream Media - Incite to Civil War & Murder Alike Due To Trump's Lawful Orders", American Thinker-Bringing Down America: A Review, Rules For Radicals, Splinter senior writer Hamilton Nolan, Weathermen led by Bill Ayers by Adina Kutnicki. Bookmark the permalink.